Kathmandu valley sightseeing with private tour guide in Nepal. Are you visiting Nepal and planning a Kathmandu valley sightseeing with private tour guide?. Book a Private Tour Guide for a trip to Nepal. Why and how to book a private Tour Guide for Trek Tour in Nepal Himalayas?. Read and book a trusted and certified Tour Guide for your trip to Nepal. Namaste! My name is Ammar Raj Guni, (book private tourist guide) born and grew up in Nuwakot located in Langtang Himalayan region of Nepal. After SLC graduate, I moved to Kathmandu city for my further university education. 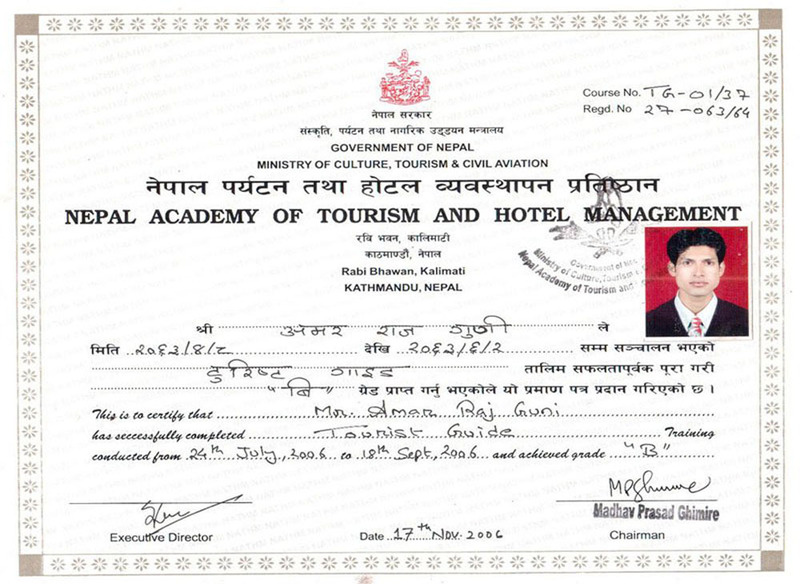 I have completed my Master in Business Studies concentrating in Tourism Management at Tribhuvan University in Kathmandu in 2009. Nepali is my mother language but in best, with the guest to communicate in English. Besides that, I speak German relatively well. I started to work in tourism in 1998 AD as a porter. Became a Trek guide from 2000 AD and leading the travelers from city tour to the high mountain base camp. Moreover, I did advance Tourist Guide training course in 2006. It was an aim to obtain a license to conduct a city tour privately. 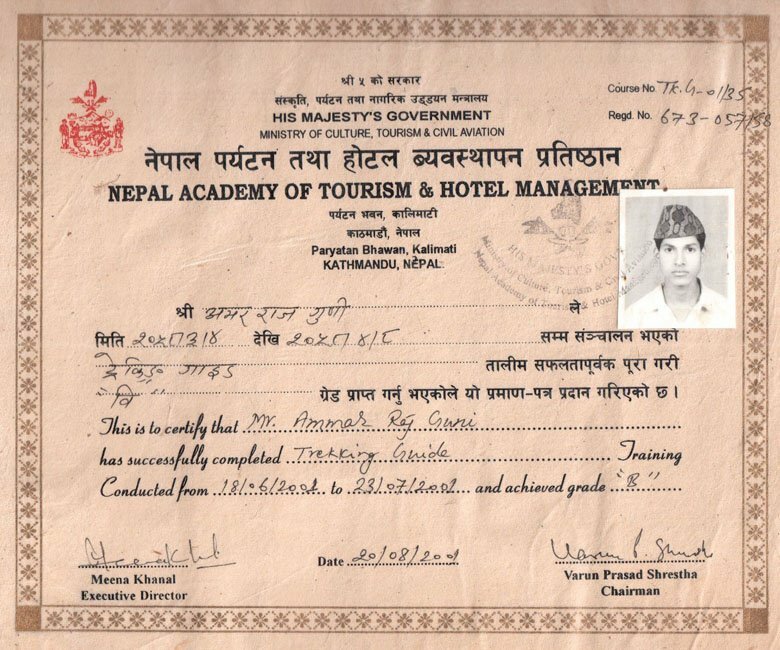 It is also called a certified Tour guide in Nepal) and Mountain guide from Nepal Mountaineering Association 2007 (license to take climbers to NMA Mountain summit listed under the NMA section). Being a professional experienced guide i can arrange Kathmandu valley sightseeing with a private tour guide. So, if you are planning to explore world heritage sites in Kathmandu, then hire me as your private tour guide. All those courses of time of guiding tourist bring me a professional guide for many years. Besides that, long years of mine experience forced me to register a trekking tour agency. And I with my brother register a trekking company “Gokyo Treks and Expedition Pvt Ltd” in 2006. I am directing this company and also guiding the Tourist especially for day hiking tour, 1 night 2 days tour, 2 nights 3 days tour. Likewise, 3 nights 4 days or 4 nights 5 days private tours and also leading the company together. Why is Kathmandu valley sightseeing with local private tour guides? In this 18 years span of Guiding time, I am becoming more knowledgeable and can deliver you the great information about Nepalese history, religion, culture, people. In Addition, also the local’s lifestyles, art and architecture, temples and monuments and as well as Buddhist stupa and monastery. At my university project work, I have published two travel guidebooks. They are useful for tourist to get depth information about “Mustang: The land of the hidden valley”, “Attraction of Kathmandu valley”. Both of them now are available on the internet. I am grateful for the many nice compliments and reviews that I have received from past guest. I am also proud of my past achievements in having helped my clients enjoy my beautiful country with its unique cultures. Are you still confusing to find a right tour guide? or Kathmandu Tours with Local Private Tour Guides who can help you to show about Kathmandu city and more?. 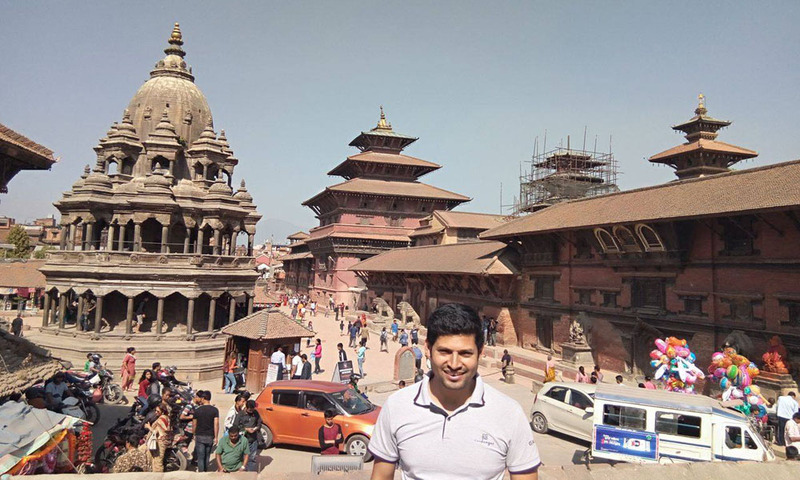 Stop thinking – Start let’s book Kathmandu valley sightseeing with a private tour guide Ammar and start exploring. I always try my best to guide you in a beast way understanding your interest. You can visit Kathmandu city tours with locals. They are Kathmandu royal palaces, Basantapur Durbar square or Hanuman dhoka durbar square. Swayambhunath stupa or Monkey temple. Furthermore, Pashupati Nath temple (Hindu’s most holy temple). In addition to Boudhanath stupa (biggest stupa of Nepal), Kopan Monastery and Budhanilkantha temple. Likewise, Patan city tours (includes Patan durbar square, Golden temple, Mahaboudha temple, Kumbheswor temple). Moreover, Bhaktapur city tours (Includes Bhaktapur main durbar square, Nyetapole square and Dattatreya square, peacock window). Changu Nayaran temple locates at the hilltop. All those places are listed under the world heritage sites UNESCO monuments in 1979. I can guide you Pokhara city, Chitwan jungle safari and as well as Lumbini, a birthplace of Lord Buddha. Book Kathmandu city Tours with Local Guides. And stay connected to make your holiday better. Kathmandu city tour with Private Guides. And the list of Private Guided Tours? Still searching a private tour guide in Nepal for Nepal private guide services?. Ask us for a tour guide rate in Nepal and make your trip similar with TURGAN guide rate. What about Kathmandu tour guide? or tour guide Nepal. How about hiring a private tour guide in Nepal to make a great trip in Kathmandu tours. Why Kathmandu valley sightseeing with private tour guide is important for travelers?. Feel free to book Kathmandu valley sightseeing with a private tour guide. Your trip sightseeing begins at 9:00 AM from your hotel. So let’s make it happen to Kathmandu Tours with Local Private Guides. Thus, I will take this opportunity to extend my hand in friendship to those who are interested in Nepal experience. I look forward to the day that I may welcome you for Kathmandu valley sightseeing with a private tour guide.